Nov. 13 (Bloomberg) -- Crude oil dropped to a one-month low after a report showed that confidence among U.S. consumers declined this month, a signal that fuel demand will decrease. Oil fell 0.8 percent as the Reuters/University of Michigan preliminary index of consumer sentiment unexpectedly weakened. An Energy Department report yesterday showed that fuel consumption slipped last week to the lowest level since June. Supplies of crude oil, gasoline and distillate fuel, a category that includes heating oil and diesel, rose. Crude oil for December delivery fell 59 cents to $76.35 a barrel on the New York Mercantile Exchange, the lowest settlement since Oct. 14. Futures, which dropped 1.4 percent this week, have climbed 71 percent this year. Price declines accelerated after the consumer sentiment report showed a decrease to 66 from 70.6 in October. The gauge was projected to rise to 71, according to the median forecast 69 economists surveyed by Bloomberg News. Refineries operated at 79.9 percent of capacity, down 0.7 percentage point from the prior week, according to yesterday’s Energy Department report. The average rate during the first week of November over the previous five years was 87.1 percent of capacity. Gasoline stockpiles rose 2.56 million barrels to 210.8 million last week, the Energy Department said yesterday. The gain left supplies 4.8 percent higher than the five-year average for the period. Inventories of distillate fuel climbed 349,000 barrels to 167.7 million, 29 percent higher than average. Gasoline for December delivery fell 2.43 cents, or 1.3 percent, to end the session at $1.9162 a gallon in New York. It was the lowest settlement since Oct. 14. Heating oil for December delivery dropped 2.49 cents, or 1.3 percent, to $1.9661 a gallon, also the lowest since Oct. 14. Supplies of crude oil rose 1.76 million barrels to 337.7 million last week, the report showed. The gain left stockpiles 7.7 percent higher than the five-year average. A weak dollar has bolstered commodity prices over the past two years as investors purchased raw materials as an alternative investment. The dollar traded at $1.4922 per euro, from $1.485 yesterday. Saudi Arabia has started to expand and upgrade its oil and gas production and refining business at a cost of $100 billion to tap rising demand in Asia, Ali al-Naimi, the kingdom’s oil minister, said in a speech at Beijing University today. Brent crude for December settlement declined 47 cents, or 0.6 percent, to end the session at $75.55 a barrel on the London-based ICE Futures Europe exchange. The December contract expired today. January futures dropped 46 cents, or 0.6 percent, to settle at $76.31. Crude oil may decline next week because of ample stockpiles and weak demand, according to a Bloomberg News survey. Fourteen of 28 analysts, or 50 percent, said futures will drop through Nov. 20. Six respondents, or 21 percent, predicted the market will rise and eight forecast little change. Oil volume in electronic trading on the Nymex was 496,264 contracts as of 2:56 p.m. in New York. Volume totaled 751,334 contracts yesterday, the highest since Oct. 15 and 33 percent above than the average over the past three months. Open interest was 1.26 million contracts. The exchange has a one-business-day delay in reporting open interest and full volume data. Nov. 13 (Bloomberg) -- The dollar declined against most of its 16 major counterparts tracked by Bloomberg as speculation the global economic recovery is gathering momentum encouraged demand for higher-yielding assets. The U.S. currency dropped against the New Zealand dollar and Norwegian krone as the euro nations emerged in the third quarter from their worst recession since World War II. The yen rose against the euro and dollar as concern eased that Japan may have trouble financing its budget deficit. The dollar slid 0.3 percent to $1.4895 per euro at 3:01 p.m. in New York, from $1.4850 yesterday. The greenback was down by the same amount this week against Europe’s currency. “Going into the first quarter, I even see more room up toward $1.60, $1.65,” said Hellmeyer, referring to the euro. New Zealand’s dollar advanced 1.3 percent to 74.24 U.S. cents and Norway’s krone appreciated 1 percent to 5.6111 per dollar on speculation investors will increase carry trades, in which they sell the currency of a nation with low borrowing costs and buy assets where returns are higher. Benchmark interest rates as low as zero in the U.S. make the dollar a favored currency for investors seeking to fund such trades. Gross domestic product in the euro region increased 0.4 percent from the second quarter, when it fell 0.2 percent, the European Union’s statistics office in Luxembourg said today. Germany’s GDP expanded 0.7 percent in the third quarter, and France’s growth was 0.3 percent, separate reports showed. The U.S. trade deficit increased 18 percent to $36.5 billion, the widest level since January, the Commerce Department said today in Washington. Imports surged, swamping a gain in exports, as the economy rebounded. The yen appreciated 0.8 percent to 89.63 versus the dollar, from 90.37, and strengthened 0.5 percent to 133.49 against the euro, from 134.21. Japanese government bonds increased, completing their first weekly advance in more than a month and pushing the yield on the 10-year security to 1.34 percent, the lowest since Oct. 19. Maintaining “the trust of investors in the government bond market is our priority,” Finance Minister Hirohisa Fujii said on Nov. 10. That day, the 10-year bond’s yield reached 1.49 percent, the highest level in almost five months. Japan’s public debt, already the largest in the industrialized world, is approaching twice the size of gross domestic product, according to the Organization for Economic Cooperation and Development. The yen was also supported as Japanese investors repatriated money on “heavy” redemptions of their investment in U.S. fixed-income assets, Hardman said. President Hu Jintao of China said at the Asia-Pacific Economic Cooperation group summit in Singapore that the world’s most populous nation will take “vigorous” steps to boost household spending and reduce a reliance on investment and exports for economic growth. China triggered speculation on Nov. 11 that the yuan may rise when policy makers dropped a pledge from their monetary- policy report to keep the currency “basically” stable. “The market is looking at appreciation expectations for the yuan again,” said Geoffrey Yu, a currency strategist at UBS AG in London. A stronger yuan will help other Asian nations be more comfortable allowing their own currencies to rise, Yu said. Eight of 10 major Asian currencies tracked by Bloomberg gained against the dollar in the past three months. The South Korean won was the best performer, rising 6.6 percent to 1,160.32 per dollar. South Korea, Brazil and Russia are losing the battle among developing nations to reduce gains in their currencies and keep exports competitive. Deputy Finance Minister Shin Je Yoon of South Korea said yesterday the nation will leave the level of its currency to market forces after adding about $63 billion to its foreign- exchange reserves this year to slow the appreciation of the won. International Monetary Fund Managing Director Dominique Strauss-Kahn urged Asian nations to let their currencies appreciate as part of the region’s contribution to a more balanced global recovery. Nov. 13 (Bloomberg) -- Crude oil fell to the lowest in a month in New York after a report yesterday showed inventories in the U.S., the world’s biggest energy consumer, climbed amid a drop in processing runs. Oil for December delivery declined as much as 94 cents, or 1.2 percent, to $76 a barrel in electronic trading on the New York Mercantile Exchange. Nov. 13 (Bloomberg) -- The dollar fell against higher- yielding currencies before a report today that may show Europe’s economy expanded for the first time in six quarters, damping demand for the greenback as a refuge. The yen was poised to advance against the dollar on speculation Japanese investors will bring home earnings on overseas assets. Losses in the dollar may be limited on speculation investors will trim bets before the end of this year that the U.S. currency will weaken further. The Norwegian krone rose to 5.6517 per greenback as of 9:24 a.m. in Tokyo from 5.6658 yesterday in New York. The Australian currency gained to 92.60 U.S. cents from 92.35 cents. The dollar traded at $1.4862 per euro from $1.4850, when it rose as much as 1.1 percent. This week, the dollar has dropped against 13 of the 16 most-traded currencies. The yen was at 90.23 per dollar from 90.37, and traded at 134.11 per euro from 134.21. Japan’s currency has dropped 0.5 percent versus the dollar and the euro this week. Economists in a Bloomberg News survey predict gross domestic product in the 16-nation euro region expanded 0.5 percent in the third quarter from the second, when it contracted 0.2 percent. The European Union’s statistics office in Luxembourg will release the data today. Futures traders reduced bets the dollar will fall against seven currencies including the euro, according to data from the Washington-based Commodity Futures Trading Commission. The difference in the number of wagers by hedge funds and other large speculators on a decline in the U.S. currency compared with those on a gain -- so-called net shorts -- was 175,462 on Nov. 3, compared with net shorts of 191,950 a week earlier. The U.S. will make $100.5 billion in redemption and coupon payments for Treasuries on Nov. 16, according to estimates by Stone & McCarthy Research Associates in Princeton, New Jersey. Japan held $731 billion in U.S. government debt as of August, the second-largest holder after China, which had $797 billion, according to Treasury Department data. FKLI Nov Futures contract traded 7 points lower to close at 1268.5 levels as compare to previous trading session to with a total of 3,916 lots traded in the market. FKLI was traded lower due to sharp reverse for regional indices towards south despite most of the regional indices were traded positive during earlier trading sessions. Technically, FKLI traded lower after manage to breach previous support levels at 1269 regions but temporary rested well above 38.1% Fibonacci support levels at 1263 regions. Based on technical view, FKLI seems break down from head and shoulder formation in the hourly price where neckline seen at 1269 levels. Our opinion suggests FKLI would trade higher if manage to penetrate above resistance levels at 1274 and 1282 regions. Traders were advice to hold long position upon resistance penetration while be cautious around support levels at 1263 and 1254 regions. CPO 3rd month Jan futures contract traded RM10 points higher as compare to previous trading sessions to close at RM2245 with a total of 7,795 lots traded in the market. CPO price retrace lower after traded higher during earlier session as soybean oil and crude oil were trade firm during overnight trading but fall back during electronic trading. 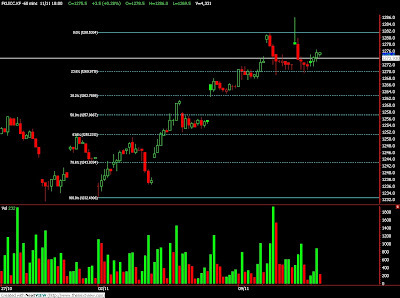 Technically, CPO price rested on support levels at RM2244; 61.8% Fibonacci support levels after attempt to complete 38.1% Fibonacci resistance levels at RM2276 regions. 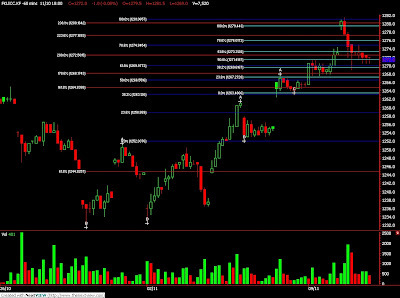 Based on technical view, CPO price practice 2nd attempt to breach daily resistance levels at RM2270 regions but failed hence pull back towards 61.8% Fibonacci support levels at RM2244 regions. Our opinion suggests CPO price would likely to trade higher in the coming trading sessions provided support levels at RM2236 and RM2215 were not breach during trading session. Traders were advice to hold long position in the coming trading session while be cautious around resistance levels at RM2275 and RM2330 regions. Nov. 12 (Bloomberg) -- Palm oil climbed for the first time in three days, tracking soybeans, which advanced on speculation dry weather in Argentina will shrink the crop in the biggest exporter of cooking oil and livestock feed made from the oilseed. Dry weather was building across western areas of Argentina and began to spread into the northeast, MDA EarthSat Weather Services Inc. said in a report yesterday. Soybeans are sown in the country from September through January. Futures for January delivery gained as much as 1.7 percent to 2,272 ringgit ($672) a metric ton on the Malaysia Derivatives Exchange, the biggest intraday advance in a week, and traded at 2,260 ringgit at 12:30 p.m. break. Prices have gained 33 percent this year. Soybeans for January delivery rose 0.4 percent to $9.755 a bushel in after-hours on the Chicago Board of Trade at 12:37 p.m. Singapore time. Soybean oil jumped 2.1 percent to the highest level in almost three months yesterday. January-delivery futures traded at 38.66 cents a pound at 12:38 p.m. in Kuala Lumpur, making it 27 percent more expensive than the tropical vegetable oil. Palm oil may trade between 2,200 ringgit and 2,400 ringgit in the next two weeks and may climb further on increased demand from China and India, the biggest users, Tilak said. “The stage is set for a short bullish phase in palm oil and we are waiting for a trigger,” he said. Futures may reach 2,400 ringgit before the first quarter on speculation a strengthening El Nino may hurt output next year in Southeast Asia, Dorab Mistry, director of Godrej International Ltd., said Nov. 9. Prices may even surge to as high as 3,000 ringgit by the end of 2010 if oil reaches $100 a barrel, he said. Crude oil traded unchanged at $79.28 a barrel after gaining 0.3 percent yesterday. Nov. 12 (Bloomberg) -- Oil traded above $79 a barrel in New York as Chinese crude imports climbed in October to the second- highest level ever as increased production spurred fuel demand. Oil gained as much as 1.3 percent yesterday as China’s industrial output expanded last month, signaling a strengthening recovery in the world’s second-biggest oil-consuming country. Net oil imports were almost 19 million tons, or 4.5 million barrels a day, according to the Beijing-based customs office. Crude oil for December delivery traded at $79.52, up 30 cents, in electronic trading on the New York Mercantile Exchange at 12:07 a.m. Sydney time. Yesterday, the contract gained 23 cents to settle at $79.28. Prices have gained 78 percent since the start of the year. The dollar traded at $1.5004 per euro at 11:53 a.m. in Sydney, from $1.4987 yesterday. A weaker dollar increases the appeal of commodities as an alternative investment. “If the U.S. dollar continues to weaken that’ll certainly help commodities, in particular oil,” Barratt said. The U.S. Energy Department will publish its weekly inventory report today. Crude-oil stockpiles probably rose 1 million barrels last week as imports increased, according to the median of 16 responses from analysts surveyed by Bloomberg News. A Nov. 10 report from the American Petroleum Institute showed crude oil supplies rose 1.22 million barrels last week to 337.5 million. The Energy Department report will probably show that gasoline supplies declined 350,000 barrels, according to the survey. Stockpiles of distillate fuel, a category that includes heating oil and diesel, may have slipped 700,000 barrels. China’s net imports in October were the highest since July’s record 19.2 million barrels. China and the U.S. are responsible for 33 percent of global oil consumption, according to BP Plc. The Standard & Poor’s 500 Index increased 0.5 percent to 1,098.51 in New York yesterday, its highest close since Oct. 3, 2008. The Dow Jones Industrial Average added 44.29 points, or 0.4 percent, to 10,291.26. Australia’s benchmark S&P/ASX 200 Index gained 0.6 percent at 11:47 a.m. in Sydney. Brent crude for December settlement advanced 45 cents, or 0.6 percent, to end the session at $77.95 a barrel on the London-based ICE Futures Europe exchange yesterday. Nov. 11 (Bloomberg) -- Gold won’t fall below $1,000 an ounce again after rising 27 percent this year to a record as central banks print money to help fund budget deficits, said Marc Faber, publisher of the Gloom, Boom & Doom report. The precious metal rose to all-time highs in New York and London today as the dollar weakened. The Dollar Index, a gauge of value against six other currencies, has declined 7.9 percent this year and today fell to a 15-month low. News last week of bullion purchases by the Indian and Sri Lankan governments raised speculation that other countries would follow suit. China will keep buying resources including gold, he said. In contrast, Western countries will be lucky to avoid economic contraction, while the Federal Reserve will maintain interest rates near zero percent, he said. Nov. 12 (Bloomberg) -- The dollar traded near a two-week low against the euro before a report tomorrow forecast to show Europe’s economy expanded last quarter, damping demand for the U.S. currency as a refuge. The U.S. currency fell to $1.5014 per euro at 9:40 a.m. in Tokyo from $1.4987 in New York yesterday, when it touched $1.5048, the lowest level since Oct. 26. The dollar bought 89.87 yen from 89.87 yen, and was at $1.6616 per pound from $1.6574. The yen weakened to 134.88 per euro from 134.69 in New York yesterday. The Australian dollar surged 0.6 percent to 93.57 U.S. cents, the highest level since August 2008. Gross domestic product in the 16-nation euro region expanded 0.5 percent in the third quarter from the second quarter, when it fell 0.2 percent, a Bloomberg News survey of economists showed. The European Union’s statistics office in Luxembourg will release the report tomorrow. The European Central Bank has kept its benchmark interest rate at 1 percent since May and is lending banks unlimited cash for periods of up to a year to haul Europe out of the recession. President Jean-Claude Trichet signaled on Nov. 5 that the ECB’s December offer of 12-month loans to banks will be the last. The yen declined as Asian stocks gained. The Nikkei 225 Stock Average rose 0.4 percent and the MSCI Asia-Pacific excluding Japan Index climbed 0.3 percent after the Standard & Poor’s 500 Index added 0.5 percent yesterday. 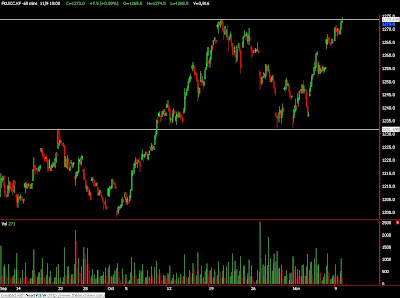 The euro-yen had a correlation of 0.79 with the MSCI Asia- Pacific excluding Japan index in the past year, according to data compiled by Bloomberg. A reading of 1 would mean the two moved in lockstep. Benchmark rates of 0.1 percent in Japan and as low as zero in the U.S. compare with 3.50 percent in Australia and 2.5 percent in New Zealand, attracting investors to the South Pacific nations’ assets. The risk in such trades is that currency market moves will erase profits. The number of Australians employed rose 24,500 in October from the previous month, the statistics bureau said in Sydney today. The median estimate of 20 economists surveyed by Bloomberg was for a decline of 10,000. The jobless rose to 5.8 percent from 5.7 percent. FKLI Nov Futures contract traded 3.5 point higher to close at 1275.5 levels as compare to previous trading session to with a total of 4,331 lots traded in the market. FKLI traded higher as regional indices were traded firm during trading sessions while Dow Jones futures electronic trading fly before FKLI ended the trading session for the day. Technically, FKLI support levels at 1270 regions were tested the 2nd time after manage to open higher at 1278 regions while high at 1286 regions were traded due spread trading. Based on our technical view, FKLI should not be considered break high as it fails to close higher. However, our opinion suggests FKLI would trade higher in the coming trading sessions provided support levels at 1270 and 1262 were not violated. Traders were advice to hold long position while be cautious around resistance levels at 1282 and 1300 psychology levels. CPO 3rd month Jan futures contract traded marginally RM8 point lower as compare to previous trading sessions to close at RM2234 with a total of 3,349 lots traded in the market. CPO price was traded sideways during trading session due to mix reaction on soybean oil and crude oil trading during overnight trading and electronic trading. 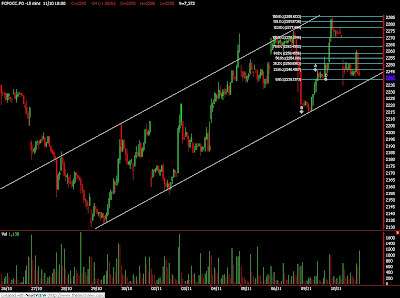 Technically, CPO price rested on the uptrend support channel line which support seen at RM2230 and RM2215 regions. Based on our technical view, CPO price is possible complete correction wave at 78.6% Fibonacci support levels at RM2230 regions while next nearest support at RM2215 regions. Our opinion suggests CPO price would continue riding on a bull trend strictly provided support levels at RM2215 and RM2200 were not violated during trading sessions. Traders were advice to hold long position provided CPO price were well hold against the selling pressure while be cautious around resistance levels at RM2253 and RM2275 regions. Nov. 11 (Bloomberg) -- Palm oil dropped for a second day on concern a seasonal decline in China’s demand ahead of winter may add to Malaysian stockpiles that soared to a 10-month high. Inventories of the world’s cheapest edible oil surged 25 percent to 1.97 million metric tons in October from a month ago, the Malaysian Palm Oil Board said yesterday. Output reached a record 1.99 million tons, the board said. “We expect slower China palm oil imports in the near term as winter approaches,” said Liong Chee How, analyst at Kenanga Investment Bank Bhd., in a note to clients today. Winter demand for palm oil slows as the tropical oil clouds in cooler climes. January-delivery futures declined as much as 0.8 percent to 2,225 ringgit ($658) a ton on the Malaysia Derivatives Exchange, and paused at 2,233 ringgit at the 12:30 p.m. break. The price rose as much as 0.8 percent in intra-day trading. The tropical commodity may average 2,400 ringgit next year because of higher crude oil prices, compared with 2,200 ringgit forecast for this year, Liong said. LMC International, an industry consultant, yesterday pared its forecast for palm oil because of the “incredible” increase in stockpiles. The price may reach 2,375 ringgit by April, down from 2,625 ringgit announced just a day earlier. Output of India’s monsoon-sown oilseeds such as soybeans and peanuts, harvested from late September, may drop 15 percent to 15.23 million tons from a year earlier, according to India’s farm ministry. Vegetable oils consumption will gain 500,000 tons in the year to October 2010 on strong economic growth, Dorab Mistry, director of Godrej International Ltd., said Nov. 8. “Exports to India and Pakistan should stay strong as drought in India has threatened oilseeds output,” Liong said. Malaysia’s palm oil exports tracked by Societe Generale de Surveillance jumped 22 percent to 421,311 tons in the first 10 days of November compared with the same period in the previous month. Shipments tracked by Intertek climbed to 403,302 tons from 339,195 tons, the surveyor said yesterday. Soybean oil advanced as much as 1.2 percent, making it 28 percent more expensive than palm oil. January-delivery futures were at 38.30 cents a pound at 12:39 p.m. in Kuala Lumpur. Crude oil declined for a second day and futures for December delivery traded at $78.79 a barrel at 1:31 p.m. Kuala Lumpur time. Nov. 11 (Bloomberg) -- Oil traded near $79 a barrel in New York after falling as an industry report showed an increase in crude stockpiles and the dollar climbed, curbing the appeal of commodities to investors. Oil declined 0.5 percent yesterday after the American Petroleum Institute said crude inventories increased 1.22 million barrels last week to 337.5 million. The government will report its supply figures tomorrow. Prices also fell as the dollar rose against the euro. Crude oil for December delivery traded at $78.93 a barrel, down 12 cents, in electronic trading on the New York Mercantile Exchange at 10:24 a.m. Sydney time. Yesterday, the contract fell 38 cents to settle at $79.05. Prices have gained 77 percent since the start of the year. Most U.S. stocks fell as earnings disappointed investors. Eight stocks dropped for every five that rose on the New York Stock Exchange. The dollar traded at $1.4986 per euro at 10:26 a.m. in Sydney, from $1.4993 yesterday. Tropical Depression Ida weakened and blew ashore on the U.S. mainland yesterday. Chevron Corp. said its Mississippi refinery was unaffected and Murphy Oil Corp. plans to resume output at its offshore Thunder Hawk platform today. The International Energy Agency cut its long-term forecast for global oil demand yesterday as the economic crisis reduces consumption in developed economies and environmental policies encourage alternative energy use. Global oil demand is expected to advance 1 percent a year to 105 million barrels a day by 2030 from 85 million in 2008, the adviser to 28 nations said in its annual World Energy Outlook. The figure is below last year’s 2030 estimate of 106 million barrels a day. The Energy Department will report that U.S. inventories of crude oil rose 1 million barrels last week, according to the median of 15 estimates by analysts surveyed by Bloomberg News. The department is scheduled to release its weekly report tomorrow at 11 a.m. in Washington, a day later than usual because of the Veterans’ Day holiday today. Brent crude for December settlement fell 27 cents, or 0.3 percent, to end the session at $77.50 a barrel on the London- based ICE Futures Europe exchange yesterday. Nov. 11 (Bloomberg) -- The yen climbed against the dollar and euro after Japanese machine orders rose more than forecast, adding to evidence the economic recovery is gathering momentum. The dollar reached a 15-month versus major counterparts before Chinese economic reports today that may support demand for higher-yielding assets. The New Zealand dollar fell after central bank Governor Alan Bollard said the “significant” increase in the currency is unlikely to be sustainable and may slow an improvement in the nation’s current-account deficit. The yen rose to 89.57 per dollar as of 10:15 a.m. in Tokyo from 89.81 in New York yesterday. The yen earlier touched 89.47, the highest since Nov. 2. It gained to 134.32 per euro from 134.65. The dollar was at $1.4996 per euro from $1.4993. The New Zealand dollar was at 74.30 U.S. cents from 74.35 cents. It earlier fell to as low as 74.07 cents. The so-called kiwi dropped 0.4 percent to 66.54 yen. The dollar fell to C$1.0488, the lowest level since Oct. 23, before trading at C$1.0490 from C$1.0495 yesterday. Machine orders, an indicator of business investment in three to six months, climbed 10.5 percent in September after gaining 0.5 percent in August, Japan’s Cabinet Office said today in Tokyo. The median estimate of 25 economists surveyed by Bloomberg was for a 4.1 percent gain. The Dollar Index, which IntercontinentalExchange Inc. uses to track the greenback against the currencies of six major U.S. trading partners, dropped to 74.917 from 75.021 in New York yesterday. The gauge was at the lowest level since August 2008. China’s factory output probably rose 15.5 percent in October from a year earlier after gaining 13.9 percent in September, according to the median of economists’ estimates collected by Bloomberg. The statistics bureau is set to release the data at 10 a.m. today in Beijing. China’s customs bureau will report today that exports fell 13 percent last month from a year earlier, according to another Bloomberg survey. That would be the slowest decline since December 2008. FKLI Nov Futures contract traded 1 point lower to close at 1272 levels as compare to previous trading session to with a total of 7,520 lots traded in the market. FKLI traded lower despite firm affirmation from Dow Jones overnight closing. FKLI traded lower mainly due to heavy profit taking activity of previous pre anticipate long position before session was closed for trading. Technically, FKLI manage to reach multiple objective prices at 1281.5 regions before starts correction phase which 1st support level seen at 1270 region at 23.6% Fibonacci support levels. Based on our technical view, our opinion suggests FKLI would trade higher in the coming trading session provided support levels at 1270 and 1262 were not violated during trading sessions. 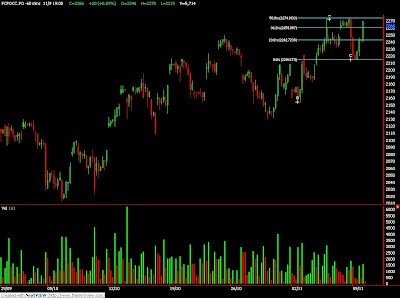 Traders were advice to hold long provided support levels were not violated while be cautious around resistance levels at 1276 and 1282.5 regions. CPO 3rd month Jan futures contract traded RM24 lower as compare to previous trading sessions to close at RM2242 with a total of 7,372 lots traded in the market. CPO price was traded choppy during trading hours due soybean oil and crude oil electronic trading were mix with overnight closing. Technically, CPO complete minor wave count at 2285 regions; 150% Fibonacci resistance level and rest on 61.8% Fibonacci support levels at RM2241 regions. Based on our technical view, our opinion suggests CPO price would trade higher in the coming trading session provided support levels RM2230 and RM2215 were not violated during trading sessions. Traders were advice to hold long position during trading sessions while be cautious around resistance levels at RM2270 and RM2330 regions. Nov. 10 (Bloomberg) -- Palm oil advanced to its highest level in more than two months as exports from Malaysia, the world’s second-biggest producer, climbed 19 percent in the first 10 days of November. Palm oil for January delivery added as much as 0.8 percent to 2,285 ringgit ($676) a metric ton on the Malaysia Derivatives Exchange, the highest price since Sept. 1, before trading at 2,270 ringgit by the 12:30 p.m. break. Futures may increase to 2,400 ringgit a ton by the first quarter as demand from India and China, the biggest consumers, recovers and El Nino may hurt output next year, according to Dorab Mistry, director of Godrej International Ltd.
“Supply worries, a pickup in demand due to the Chinese New Year festivities, global economic recovery, a smaller domestic oilseed crop from India” and increased mandates for biofuel may push prices higher through the first quarter, Ivy Ng, an analyst at CIMB Investment Bank Bhd., said in a report. Exports of palm oil from Malaysia jumped to 403,302 tons from Nov. 1 to Nov. 10 from 339,195 tons in the same period in October, independent market surveyor Intertek said today. Global palm oil production, including output from Indonesia and Malaysia, will expand 6.2 percent to 46.5 million tons next year, compared with a four-year average growth rate of 8.4 percent, Ng said, citing estimates from Oil World, a global oilseed information provider. El Nino, which can parch crops in Asia and cause flooding in South America, may increase palm oil supply worries, Ng said. Palm oil stockpiles in Malaysia climbed 25 percent to 1,974,462 tons in October from the previous month, the Malaysian Palm Oil Board said in a statement today after the market closed for midday. Output rose 27.4 percent to 1,985,055 tons and exports were up 11.8 percent to 1,478,317 tons. Crude oil dropped 0.7 percent to $78.89 a barrel and soybean oil slipped 0.8 percent to 37.87 cents per pound. Nov. 9 (Bloomberg) -- OPEC is increasing output at the fastest pace in two years, adding to near-record inventories and threatening speculators betting on $100 crude with losses. The number of options contracts to buy oil at $100 by March almost quadrupled in October and increased another 5.9 percent so far this month. As traders piled in, OPEC boosted production 4 percent, or 1.1 million barrels a day, since March amid the worst global recession since World War II. Saudi Arabia’s King Abdullah has targeted $75 oil as a fair price for consumers and producers and has the capacity to increase pumping by about 50 percent, or 4 million barrels a day, enough for all of Brazil. The prospect of more supply comes with inventories in industrial countries already the highest since 1998, when oil collapsed to $10. Futures contracts show investors expect oil at $80 in March 2010 and none of the Wall Street analysts tracked by Bloomberg predict $100 before the end of next year. Crude closed at $79.43 today on the New York Mercantile Exchange. Oil, which has jumped 78 percent this year, is heading for the biggest annual gain since 1999. The appreciation coincided with a 5.4 percent increase in U.S. stockpiles to 335.9 million barrels. The furthest-dated Nymex crude contract, for delivery in December 2017, closed at $99.43 a barrel on Nov. 4, before retreating. The number of outstanding options contracts to buy oil at $100 by March rose to 27,482 in October from 7,181 in September, and climbed another 1,609 to 29,091 by Nov. 5. The contracts cover more than 29 million barrels of crude. Inventories are mounting as the Organization of Petroleum Exporting Countries produced 28.76 million barrels a day in October, up 80,000 from September and the highest in 10 months, according to Bloomberg estimates. Saudi Arabia has raised shipments in four of the past six months, the data show. State-run Saudi Arabian Oil Co. will supply full contracted oil shipments to several refiners in Asia next month for the first time in more than a year, refinery officials said today. Saudi crude-oil production has risen to 8.15 million barrels a day after dropping to 7.86 million in February, the lowest level since 2002. Even with the recent increases, October production was down 13 percent from a year earlier. The desert kingdom has idled about 4 million barrels a day, or one-third of its capacity, according to data from the country’s oil ministry. Officials from the department didn’t return calls seeking comment. When prices were headed to a record $147.27 last year, Saudi officials increased production by 500,000 barrels a day in June and July to halt the rally. By December 2008, prices collapsed as low as $32.40. “Prices are probably at the upper end of what they are comfortable with right now because they are concerned about the health of the global economy,” said David Kirsch, an Overland Park, Missouri-based analyst with PFC Energy, an energy strategist to companies and governments. Finance ministers and central bank governors of the Group of 20 nations said Nov. 7 that while economic and financial conditions have improved, “the recovery is uneven and remains dependent on policy support, and high unemployment is a major concern.” The U.S. unemployment rate jumped to 10.2 percent in October, the highest level since 1983, the Labor Department said last week. Crude and fuel stockpiles held in non-government tanks in the 30 developed countries in the Organization of Economic Cooperation and Development rose to 2.76 billion barrels in the third quarter, close to the record 2.77 billion reached in 1998, U.S. Energy Department figures show. The 1998 glut caused oil to collapse to $10 a barrel. Now with storage tanks bulging from Singapore to Oklahoma, traders are being forced to store oil and fuel on ships that are bigger than the Chrysler Building. The amount of heating oil and jet fuel stored at sea increased 17 percent to 112 tankers with a combined capacity of 13.1 million deadweight tons, London-based Simpson, Spence & Young Ltd., the world’s second-largest shipbroker, said in a Nov. 6 report. OPEC President Jose Maria Botelho de Vasconcelos said Oct. 25 that the group may raise exports in December if prices remain above $75. Ministers are scheduled to meet on Dec. 22 in Luanda, Angola, to review production quotas that the group left unchanged at three gatherings in 2009. OPEC last agreed to increase supply targets in September 2007. OPEC will hold a special meeting if oil prices reach $100 a barrel, Kuwait’s Oil Minister Sheikh Ahmad al-Abdullah al-Sabah said in Kuwait City on Nov. 3. Rising equity prices and the weakening dollar have been reasons for the oil’s rally this year and will probably limit OPEC’s ability to dictate prices, according to Adam Sieminski, chief energy economist at Deutsche Bank AG in Washington. The dollar has dropped 7.7 percent this year against a basket of six major currencies as the Fed, led by Chairman Ben S. Bernanke, cut rates to near zero in an effort to lift the U.S. economy out of its worst recession since the 1930s. The falling dollar has hurt the buying power of oil exporters, according to Iran and Venezuela. The benchmark crude price used by OPEC, derived from the cost of oil produced by each of its 12 members, averaged $41.54 barrel in January and was at $76.25 on Nov. 6. “A floor of $80 and stability” are Venezuela’s goal for next year, the country’s oil and energy minister, Rafael Ramirez, told reporters in Caracas on Nov. 4. “I do not think the current price is hindering the recovery of the world economy,” Iraqi Oil Minister Hussain al-Shahristani said in an interview in Baghdad yesterday. Iran pumped an average 444,000 barrels a day above its OPEC target in October, making it the biggest quota-buster, according to data compiled by Bloomberg. Venezuela produced 234,000 barrels more than its target. Nov. 10 (Bloomberg) -- Crude oil traded near $79 a barrel in New York after rising yesterday as the dollar weakened and Tropical Storm Ida entered the Gulf of Mexico, forcing BP Plc and Chevron Corp. to cut output. Oil rose as much as 3.6 percent yesterday as the dollar fell against the euro, increasing the appeal of commodities as an alternative investment. Workers were evacuated in the Gulf of Mexico, an area that accounts for 27 percent of U.S. crude production and 15 percent of natural gas output. Crude oil for December delivery traded at $79.38 a barrel, down 5 cents, in electronic trading on the New York Mercantile Exchange at 10:17 a.m. Sydney time. Yesterday, the contract rose $2.00, or 2.6 percent, to $79.43. Prices have gained 78 percent since the start of the year. Rising equities also helped push energy prices higher. The Standard & Poor’s 500 Index added 2.2 percent to 1,093.08 in New York yesterday, and the Dow Jones Industrial Average increased 2 percent. The dollar traded at $1.5002 against the euro at 10:19 a.m. in Sydney, from $1.4999. Oil reached a one-year high of $82 on Oct. 21, as rising equities boosted investor confidence and a falling dollar encouraged buying of physical assets. Ida’s maximum sustained winds are near 70 miles (110 kilometers) per hour, the U.S. National Hurricane Center said in an advisory yesterday. Ida’s center was located about 60 miles southeast of the mouth of the Mississippi River and was moving north at 18 mph, the center said. Chevron, the second-largest U.S. oil company, said it has shut some of its Gulf output and moved away some “non-essential personnel.” BP has started “some precautionary curtailment of production,” according to a recorded statement on its hotline. U.S. crude-oil inventories probably rose 1 million barrels in the week ended Nov. 6, according to the median of 10 estimates by analysts before an Energy Department report. The department is scheduled to release its weekly report on Nov. 12 at 11 a.m. in Washington, a day later than usual because of the Veterans’ Day holiday on Nov. 11. Brent crude for December settlement rose $1.90, or 2.5 percent, to $77.77 a barrel on the London-based ICE Futures Europe exchange yesterday. Nov. 10 (Bloomberg) -- The dollar traded near a two-week low against the euro before reports tomorrow that economists say will show China’s industrial production gained and its exports declined at the slowest pace in 10 months. The figures and a rally yesterday in global equities that pushed the Dow Jones Industrial Average to a 13-month high may sap demand for the dollar as a refuge. Losses in the euro versus the yen were limited before a report today forecast to show France’s industrial output rose in September for a fifth month. The dollar traded at $1.5006 per euro as of 8:29 a.m. in Tokyo from $1.4999 in New York yesterday, when it touched $1.5020, the lowest since Oct. 26. The yen was at 134.99 per euro from 134.91. The dollar fetched 89.96 yen from 89.93 yen. The Dow gained 2 percent to 10,226.94 yesterday, the highest level since October 2008. The Standard & Poor’s 500 Index rose 2.2 percent to 1,093.08. The Dollar Index, which IntercontinentalExchange Inc. uses to track the greenback against the currencies of six major U.S. trading partners including the euro, yen and pound, dropped 1 percent to 75.044 yesterday in New York. The gauge touched 74.930, the lowest level since August 2008. The index has lost 7.7 percent in 2009. Economists surveyed by Bloomberg News forecast China’s factory output probably rose 15.5 percent in October from a year earlier after gaining 13.9 percent in September. The statistics bureau is set to release the data tomorrow in Beijing. The customs bureau is forecast to report China’s exports fell 13.0 percent last month from a year earlier, according to another Bloomberg survey. That would be the slowest decline since December 2008. The report is due tomorrow. French industrial production gained 0.5 percent in September after rising 1.8 percent in August, according to a Bloomberg News survey of economists. FKLI Nov Futures contract traded 7.5 points higher to close at 1273 levels as compare to previous trading session to with a total of 3,816 lots traded in the market. FKLI traded higher during trading sessions due to some positive news release regarding expectation of 6%GCP growth until year 2020 to meet target of USD17, 000 per capita incomes despite regional indices were not much of volatility during trading sessions. Technically, FKLI challenge previous high resistance levels at 1273.5 regions with closing at 1273 regions. FKLI daily price chart shows lower possibility to form double top formation as it’s still lack of higher participation around previous high at 1273.5 regions. Based on our technical view, our opinion suggests FKLI would likely to trade higher in the coming trading sessions provided resistance levels at 1273.5 and 1282.5 regions. 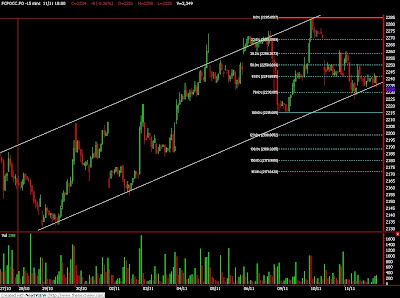 Traders were advice to hold long position while be cautious around support levels at 1270.5 and 1263 regions. CPO 3rd month Jan futures contract traded RM20 higher as compare to previous trading sessions to close at RM2266 with a total of 5,714 lots traded in the market. CPO price was traded firm as crude oil and soybean oil electronic trading was traded firm during electronic trading while they were ended weak during last week session. 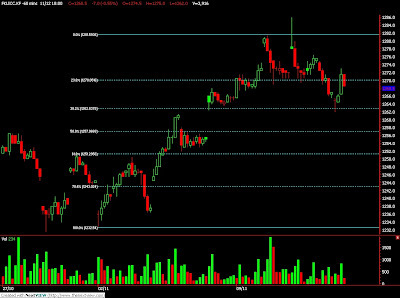 Technically, CPO price surge after holding well above support levels at RM2217 regions; 61.8% Fibonacci support levels. Based on our technical view, our opinion suggests CPO price would trade higher in the coming trading sessions provided support levels at RM2215 and RM2230 were not violated during trading sessions. 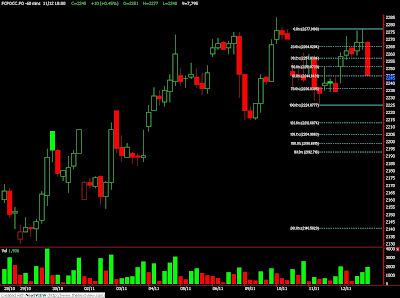 Traders were advice to hold long position while be cautious around resistance levels at RM2287 and RM2333 regions. Nov. 9 (Bloomberg) -- Palm oil prices may advance 7 percent by the first quarter driven by a revival of demand from China and India, the world’s two biggest importers, said Dorab Mistry, director of Godrej International Ltd.
“After a few weeks, as demand from China and India returns, I expect crude palm oil futures to begin to rise and to attain my target of 2,400 ringgit in the first quarter of 2010,” Mistry said in comments prepared for delivery at a conference in Guangzhou, China, yesterday. The prediction is the equivalent of $709 per metric ton. Palm oil, used in cooking and fuel, has climbed 33 percent this year as crude oil gained 75 percent and rains and freezing weather threatened harvesting of the soybean crop in the U.S., the biggest producer, potentially reducing output of soybean oil. The price outlook in 2010 appears “friendly,” he said, adding much will depend on energy costs. His forecasts are based on crude oil around $80 per barrel in the next few months, a euro around $1.50 and the rupiah around 9,400 to the dollar. China and India appear to be “well-covered” at present and it’s possible that palm oil stockpiles will build in the next few weeks toward the end of the calendar year, he said. Palm oil stockpiles in Malaysia, the second-biggest producer, will probably peak at 2.1 million tons at the end of December before declining in the New Year, said Mistry, whose speech was delivered in his absence as he was unable to attend the conference. “Whilst this figure may seem daunting, it will represent less than six weeks consumption,” he said. “It is likely stocks will decline from January or latest from February onwards.” Inventories rose 12 percent to an eight-month peak of 1.58 million tons in September, the palm oil board said Oct. 12. “It is quite possible markets may come under pressure” and futures may break 2,100 ringgit temporarily, he said. “I no longer expect CPO futures to decline to 1,900 and believe they have bottomed out at the recent low of 2,020,” he said. January-delivery palm oil last traded little changed at 2,246 ringgit ($660) per ton on the Malaysia Derivatives Exchange on Friday. The Southern Oscillation Index had turned “sharply negative” in the past three to four weeks and this is “usually a clear pointer to a strengthening El Nino,” he said. “It appears that we are on the brink of dry weather and rainfall deficits in Malaysia as well as Indonesia,” he said. “A new stronger El Nino will have a profound effect on CPO production” in June to September, he said. Palm oil stockpiles in Indonesia, the world’s biggest producer, will increase in the coming months because of higher output, Derom Bangun, a deputy chairman of Indonesia’s Palm Oil Board, said Nov. 2. Inventories probably increased to 1.7 million tons in October, compared with the August and September average of 1.3 million tons to 1.4 million tons, he said. Mistry has previously forecast that Indonesian production would gain by 2 million tons in 2010 and Malaysian output by 500,000 tons. Imports of vegetable oils by India will be “more or less the same” in the year starting Nov. 1, 2009, as in 2008-2009 or about 8.6 million tons, he said. Palm oil purchases by the country, the largest importer, will be 6.9 million tons, up from 6.65 million, he said. Total consumption of vegetable oils will gain by 500,000 tons on strong economic growth, he said. Nov. 8 (Bloomberg) -- Malaysian palm oil stockpiles will reach a peak of 2.1 million metric tons at the end of December before likely declining in the new year, Dorab Mistry, director of Godrej International Ltd., said. “Whilst this figure may seem daunting, it will represent less than six weeks consumption,” Mistry said in comments prepared for delivery at a conference in Guangzhou, China. “It is likely that stocks will decline from January or latest from February onwards.” Malaysia is the second-biggest producer of palm oil, which competes with soybean oil for use in cooking and biodiesel. Rising stockpiles could ease concerns of an oilseed shortage, which has helped lift palm oil prices by 33 percent this year. Inventories in Malaysia rose 12 percent to 1.58 million tons in September from August, an eight-month high, the nation’s palm oil board said on Oct. 12. “After a few weeks, as demand from China and India returns, I expect crude palm oil futures to begin to rise and to attain my target of 2,400 ringgit in the first quarter of 2010,” said Mistry, whose speech was delivered in his absence as he was unable to attend the conference. Palm oil stockpiles in Indonesia, the world’s biggest producer, will also increase in the coming months because of higher output, Derom Bangun, a deputy chairman of Indonesia’s Palm Oil Board, said Nov. 2. Inventories probably rose to 1.7 million metric tons in October, compared with the August and September average of 1.3 million tons to 1.4 million tons, he said. “A new stronger El Nino will have a profound effect on crude palm oil production in the June to September period of 2010,” Mistry said. The El Nino weather phenomenon can cause drought in parts of Asia, affecting crops. January-delivery palm oil last traded little changed at 2,246 ringgit ($660) per ton on the Malaysia Derivatives Exchange on Nov. 6. --Feiwen Rong. Editors: Richard Dobson, Sean Collins. Nov. 6 (Bloomberg) -- Gold futures jumped to a record, topping $1,100 an ounce, on mounting speculation that low U.S. borrowing costs will drive down the dollar, boosting the appeal of the precious metal as an alternative investment. The metal reached $1,101.90 in New York, heading for a ninth straight annual gain. The dollar is down 6.8 percent this year against a basket of six major currencies as the Federal Reserve keeps its benchmark interest rate at zero to 0.25 percent to revive economic growth. “Until Washington stops exploding the deficit, the dollar will continue to weaken, and gold is going higher,” said Tom Pawlicki, an analyst at MF Global Ltd. in Chicago. Gold futures for December delivery rose $6.40, or 0.6 percent, to $1,095.70 on the Comex division of the New York Mercantile Exchange, climbing for the fifth straight day. The price has gained 24 percent this year. The jobless rate and low inflation will keep the Fed from raising rates until 2011, John Brynjolfsson, the chief investment officer at hedge fund Armored Wolf LLC in Aliso Viejo, California, said in an interview on Bloomberg Television. The unemployment rate in the U.S. reached a 26-year high of 10.2 percent in October, the Labor Department said today. Consumer costs rose 0.3 percent last month, according to the median forecast of economists surveyed by Bloomberg News. President Barack Obama has increased the nation’s marketable debt to an unprecedented $7 trillion as the government borrows to fund spending programs intended to bolster the economy. Seventeen of 23 traders, investors and analysts surveyed by Bloomberg, or 74 percent, said bullion will rise next week. Four forecast lower prices, and two were neutral. This week, gold gained 5.3 percent, the most since April, after India said it purchased 200 metric tons of gold from the International Monetary Fund last month. Other central banks may follow in a shift away from the dollar, analysts said. Sri Lanka’s central bank, which has been purchasing gold for the past seven months, will continue buying the metal as a hedge against volatility in currency markets, Ajith Nivard Cabraal, the bank’s governor, said today. Cabraal, speaking in Colombo, declined to say how much had been bought. Sri Lanka held 5.3 metric tons of gold as of September, according to World Gold Council data. Gold holdings in the SPDR Gold Trust, the biggest exchange- traded fund backed by bullion, declined to 1,108.34 tons as of yesterday from 1,108.4 tons on Nov. 4. “We are rather concerned about the crowded nature of the gold market, for everyone, everywhere is long of gold and bearish of the dollar,” economist Dennis Gartman said in his Suffolk, Virginia-based Gartman Letter. Silver, which has wider industrial applications than gold, declined on concerns that demand will falter because of the sluggish economy. Silver futures for December delivery fell 3.5 cents, or 0.2 percent, to $17.375 an ounce. The price has climbed 54 percent this year.